John Grigg and Australian astronomer James Skjellerup co-discovered a comet now known as the Grigg-Skjellerup comet. This comet was closely examined by the spacecraft Giotto in 1992 as it passed within 200 kilometres of it. Unfortunately no photos were taken, as Giotto’s camera had been damaged in an earlier encounter with a speck of dust from Halley’s comet. 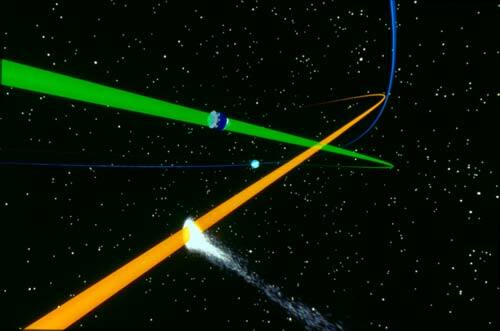 The path of the spacecraft is shown in green, the comet's is yellow and Earth's orbit is shown in blue.